Cats are wonderful creatures, and you got one of the best! Very loyal cat! You get one of the best that can participate in the coming Olympic game. The king of cats, the large orange male. This past Christmas my own Stewie (King James) arrived at my back door from a nearby barn. So far he doesn’t follow me in the woods–not that I can go there very often anymore. I have never had a close encounter with bluets, just seen them at a distance. Lovely. Thanks to Meredith I see you are back to blogging. We once had a cat who followed us along the next garden. But that was it. Unusual that Stewie enjoys the walk more than the dog. WA, Sure he is a great cat! What a trooper for getting out on that log AND getting his tail wet. My Grumpy would follow me around the yard. What a face! I envy you. What a handsome devil that Stewie is. I’m impressed how far he will walk with you. 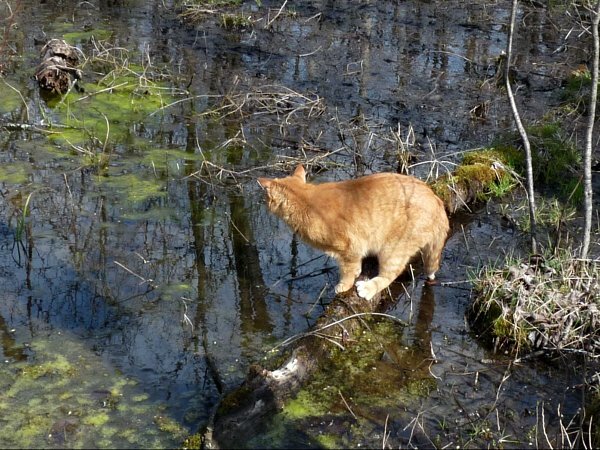 Our cat likes to tag along as well and hates to get left behind but he has his limits of how far he’ll go. The rock wall which the cat is resting upon is my favorite. When I walk in the Alabama woods with my husband I am constantly stopping to photograph the old rocks covered in mosses and burried in leaves. He wants to know why I wish to photograph them He doesn’t see the beauty which I see. Stewy looks like a great companion. He also looks HUGE! He is a very handsome guy.